CHERRY HILL, New Jersey -- The search continues for a Norman Rockwell painting that was stolen 40 years ago from a Cherry Hill, New Jersey home. 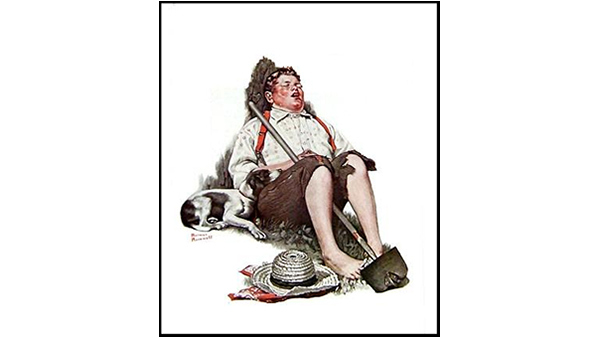 The FBI Art Crime Team and the Cherry Hill Police Department are asking for help in locating the painting, known by many names including Boy Asleep with Hoe, Taking a Break, and Lazybones, which was stolen during a break-in on June 30, 1976. The piece dates back to 1919. It is oil on canvas, approximately 25 inches by 28 inches, and was featured on the cover of the September 6, 1919 edition of the Saturday Evening Post. The painting has been entered in the FBI's National Stolen Art File, and Interpol's Stolen Works of Art Database. The FBI is highlighting the search on the theft's 40th anniversary. Anyone who may have information on the painting's theft or current location is asked to contact the FBI at 215-418-4000.